Not a fan of vegetables? You should be! Vegetables are full of all the good things you need to stay healthy including fiber, vitamins, minerals, enzymes and phytonutrients. If you have been missing out on vegetables you could be preventing your body from making a full recovery, not to mention reducing your performance in the gym. The nutrients in vegetables can help cleanse and detoxify your body, but getting them in can be tough if you’re not a fan. 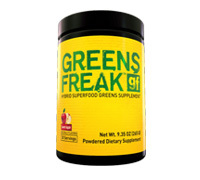 PHARMAFREAK’s GREENS FREAK is loaded with superfood phytonutrients; you’re getting the benefit from not just one or two vegetables but from multiple, all in a convenient single serving scoop! A better question might be, what’s not in it. This high potency powdered greens supplement combines nine different high potency, superfood blends including 38 unique ingredients such as Hawaiian Spirulina, Alfalfa for immune support, Barley Grass for high amounts of natural vitamins and enzymes, and Wheat Grass for detoxification. It also contains nitrate rich Beetroot, digestive enzymes, liver supporting milk thistle extract, probiotic cultures, immune and adaptogen support ingredients. Why Do You Need a Greens Supplement? If you workout regularly and are following an intense workout routine, then you’re muscles are no doubt experiencing a build up of acidity. Add on a high protein restricted diet, that can also cause acidity and you’re dealing with an overload on your system, making it harder to recover from your workouts. GREENS FREAK helps reduce acidity and brings back balance, putting the body in an alkaline state. GREENS FREAK can also help detoxify the body by providing it an array of phytonutrients that help combat oxidation brought on by free radical damage in the body from an intense workout. What Should You Stack With GREENS FREAK? Looking to improve performance, support muscle growth and recovery, while optimizing health and well being, then you will want to combine GREENS FREAK with VITA FREAK! VITA FREAK is a high-potency multi-vitamin, mineral and nutrient supplement pack that supports optimal health. Together these two nutrient dense products combine for the ultimate health stack! How Do You Use GREENS FREAK? GREENS FREAK is easy to use, simply mix 1 scoop with about 8 oz of cold water and enjoy. This greens supplement can also be mixed with a scoop of your favorite protein powder! 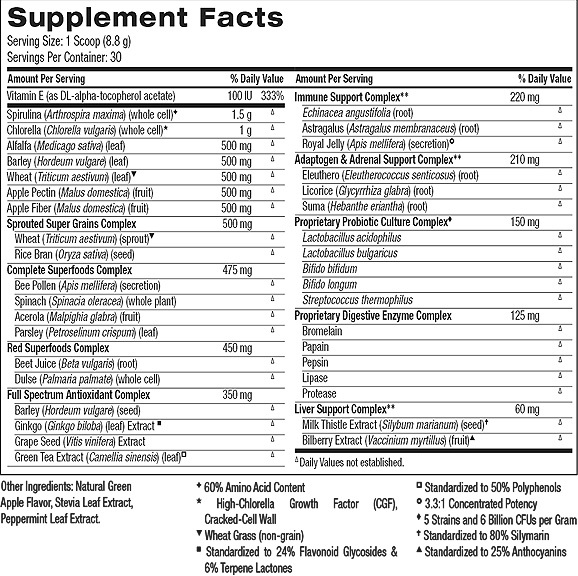 Use: As a dietary supplement, adults take 1 scoop daily to support micronutrient needs. Mix 1 scoop with 8 ounces (237 mL) of water and consume immediately. Warning: KEEP OUT OF REACH OF CHILDREN. Do not use if pregnant or nursing. Not intended for use by persons under the age of 18 years. This product contains royal jelly and bee pollen and may cause an allergic reaction in some people. Consult a physician before using this product if you have any medical condition, if you require surgery, or if you are taking any over-the-counter or prescription medication. Use only as directed. Do not exceed recommended serving, as improper use of this product does not enhance results. Store in a cool, dry place.